ORWIND SKYFAST 4G SOLARHD SOLAR- POWERED 3G/4G SIM & WIFI SUPPORTED*LIVE* CAMERA PLUG & PLAY GSM Sim SupportedOutdoor Wireless Waterproof Smartest Full Hd IPCCTV Camera | Live View On PC & Mobile – No DVRNeededSuper Highlights:-★ AVAILABLE MODELS : 5.0 MP & 8.0 MP Camera Lens Models. ★ EasyPlug & Play 2 Minutes Installation ★ Motion Detection & Notification ★360° Rotation Camera.★ Suitable For All Iphone/ Android / Tablet OrWindows Devices. ★ Completely Wireless No Need Of Any Wire ExceptElectricity. 3G standard: WCDMA | Frequency range: B1(2100MHz),B8(900MHz) | 4G standard: FDD-LTE | Frequency range: B1(2100MHz),B3(1800MHz), B7(2600MHz), B8(900MHz), B20(800MHz) - This 3G + 4G IPcamera mostly used for those environment place not have internet buthave SIM mobile signal, | You Just have to put a SIM card into cameraand connect internet by your SIM card. - This 3G + 4G IP cameraConnection Way: Insert your SIM card into camera, then power on,connect SIM Card internet. | No need to connect network LAN cable ! Noneed to setup WIFI ! -The 3G 4G ip camera supports mobile phone appand a remote clients CMS. | The 3G 4G ip Camera support Cloud FTPstorage ★ P2P Function Device With Advanced Playback Function. ★IP66 Waterproof Outdoor WIRELESS Wifi Air Camera. ★ FULL HDResolution & Web Access. 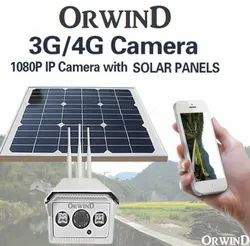 Orwind.In*OVERVIEW*: ORWIND HD SOLAR-SKYFAST 4GSOLAR POWERED 3G/4G SIM & WIFI SUPPORTED *LIVE* CAMERAPLUG & PLAY GSM Sim Supported Outdoor Wireless WaterproofSmartest Full Hd IP CCTV Camera | Live View On PC & Mobile –No DVR Needed*Key Features *:★ AVAILABLE MODELS : 5.0 MP & 8.0 MP Camera Lens Models. ★ Easy Plug & Play 2 Minutes Installation ★ Motion Detection &Notification ★ 360° Rotation Camera.★ Suitable For All Iphone/ Android / Tablet Or Windows Devices. ★ Completely WirelessNo Need Of Any Wire Except Electricity. 3G standard: WCDMA | Frequency range: B1(2100MHz), B8(900MHz) | 4G standard:FDD-LTE | Frequency range: B1(2100MHz), B3(1800MHz), B7(2600MHz), B8(900MHz), B20(800MHz) - This 3G + 4G IP cameramostly used for those environment place not have internet but have SIM mobile signal, | You Just have to put a SIM card intocamera and connect internet by your SIM card. - This 3G + 4G IP camera Connection Way: Insert your SIM card into camera, thenpower on, connect SIM Card internet. | No need to connect network LAN cable ! No need to setup WIFI ! -The 3G 4G ip camerasupports mobile phone app and a remote clients CMS. | The 3G 4G ip Camera support Cloud FTP storage ★ P2P Function DeviceWith Advanced Playback Function. ★ IP66 Waterproof Outdoor WIRELESS Wifi Air Camera. ★ FULL HD Resolution & WebAccess.Description: ORWIND INC. brings World's most convenient WIFI IP CAMERA From installing to setting up to customerfriendly app that allows two way speaking, accessing history of the Camera through the app, to motion detection barking alert - thissmall wonder is full of big surprises and never before features | ORWIND P2P WIRELESS WIFI BASED CAMERA’S - Watch high qualitylive video and image from anywhere on your mobile phone, never miss any moment..Supports upto 128 gb Micro Sd Card Class 10(Approx. 15 Days Recording). - With built in mike & speaker now communicate & give instruction to people from your mobile phoneeven when you are travelling. With Built in 36pcs IR LEDs with 60m – 100m IR range models get crystal clear vision even in dark. –Models With UPTO 180-degree view and digital zoom, ORWIND Smart Eye Lenses gives you stunning live video stream on your mobilephone. Easy for Both Wall mounting and Ceiling-mounting Models Available only by Orwind Inc. Looking for LED Dancing Light Laser ?